Beta sign-ups for Killzone: Mercenary will be open until Wednesday, July 17th. When the PlayStation Vita first launched, many gamers imagined it to be the perfect platform for some portable first-person shooting. That said, the FPS titles released on the platform since its launch have been markedly sub par, leaving many to wonder if the Vita will ever play host to a competent shooter. Currently, hopes reside with Killzone: Mercenary and now, players eager to give that game's multiplayer a try can apply for a chance to do so. Guerilla Games is currently allowing people to sign-up for a chance to participate in a closed beta of Killzone: Mercenary's multiplayer mode. Interested players have until 2:00 PM PDT on July 17th, to enter their PSN ID into a drawing that will result in a few lucky participants gaining access to the beta. According to Mark Green, Senior Producer at Guerilla Cambridge, the beta will "provide players with a diverse range of weapons, grenades, armor, and special VAN-Guard devices enabling the player to customize their multiplayer load-out slots." While the opportunity to try out the beta is certainly exciting, our sights are set on the finished product and seeing how it stacks up against less successful Vita shooters like Resistance: Burning Skies and Call of Duty: Black Ops- Declassified. Considering how low those set the bar, it shouldn't be too hard for Killzone: Mercenary to top them. 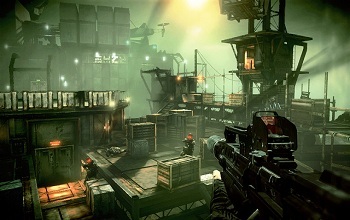 Killzone: Mercenary is set to hit stores on September 17th, 2013.